As 2017 draws to a close, we have to pinch ourselves when we think of the amazing year we’ve had at Rakis! Each and every year the Rakis team like to embody next level ‘extra-ness’ with an elaborative, themed team photo shoot. The type of photo that blows you away yet makes you smirk simultaneously. These team photo shoots pay homage to our colourful and vivacious personalities, that shine through with every salon visit. Directed by our legendary Stavros, this year we dazzled with a sultry Egyptian theme and brought that extra pizazz with our Moulin Rouge shoot, AKA Moulin Rakis at the Regent Theatre. Our Spring/Summer Campaign was dramatic, emotive and breathtaking and the creative team at Rakis had no problems pulling together a truly beautiful look. The gorgeous Juliette Elle and her naturally divine hair was a dream come true for Creative Director, Danny to work with. The masterpiece was completed with a dreamy background and floral halo designed by the infamous floral designer, Mr Ross Jenkins or Bloom Boy as you may know him, to create something truly exquisite. This year, we’ve had Dannii Minogue,Daniel Merriweather,Joel Creasey,Juliette Elle,Ainsley Melham,Pettifleur Berenger, andLauren Brantwalk into our salon multiple times. 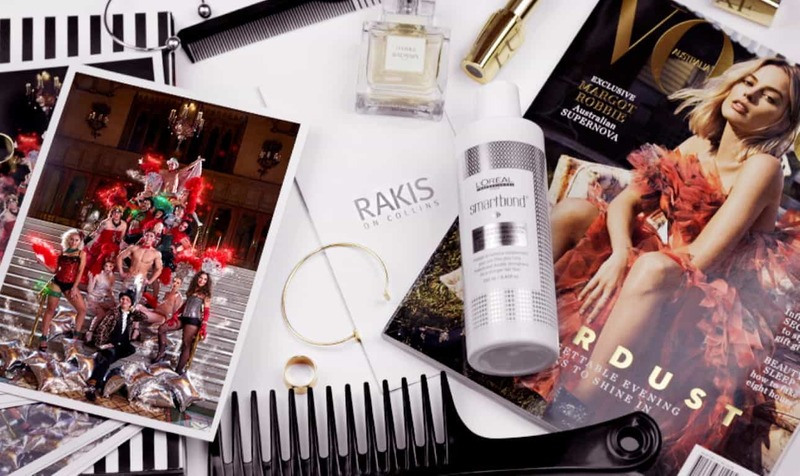 We love having celebs in our salonnot just because they’re famous, but for Stavros, he loves having thembecause they’re highly successful in their fields, and they’ve chosen to have their hair done at Rakis on Collins as they identify with oursuccess. That is why their patronage is such an encouragement for us. But more importantly, we pride ourselves on loving each and everybeautiful face that walks through our salon door. We also believethrough every client, we’ve been blessed with the opportunity torealise our art and our clients’ expectations in hair while deliveringan experience that’s uniquely Rakis on Collins. So here’s to YOU, our valued client, what a year it’s been. We lookforward to what 2018 will bring for Rakis on Collins. Until then, wewish you a wonderful Christmas and fabulous New Year.